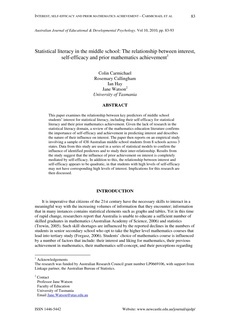 This paper examines the relationship between key predictors of middle school students’ interest for statistical literacy, including their self-efficacy for statistical literacy and their prior mathematics achievement. Given the lack of research in the statistical literacy domain, a review of the mathematics education literature confirms the importance of self-efficacy and achievement in predicting interest and describes the nature of their influence on interest. The paper then reports on an empirical study involving a sample of 438 Australian middle school students from 8 schools across 3 states. Data from this study are used in a series of statistical models to confirm the influence of identified predictors and to study their inter-relationship. Results from the study suggest that the influence of prior achievement on interest is completely mediated by self-efficacy. In addition to this, the relationship between interest and self-efficacy appears to be quadratic, in that students with high levels of self-efficacy may not have corresponding high levels of interest. Implications for this research are then discussed.